This view is looking east, with the Putney site on the distant dome along the skyline, near the center of the image. 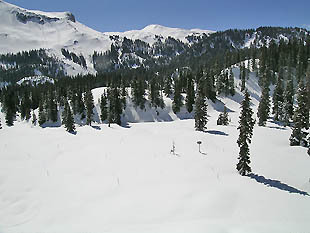 The Swamp Angel Study Plot (SASP) is located in a sheltered ‘hollow’ clearing at the lower end of the Senator Beck Basin Study Area, at approximately 11,060’ (3371m), well below treeline and surrounded by sub-alpine forest. The site derives its name from the historic Swamp Angel mine nearby. 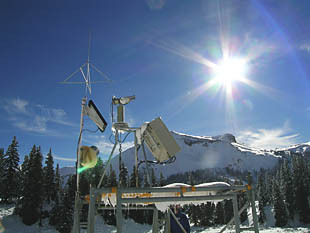 This protected location provides an excellent location for measuring precipitation and snowpack accumulation, where wind speeds are very low (winter hourly average is less than 1 m/s) and wind redistribution of snowcover is negligible, and a correspondingly poor location for monitoring wind speeds or direction representative of the Red Mountain Pass vicinity. Further, because the site sits in this sheltered ‘pocket’ at the lower end of the Senator Beck Basin watershed, air temperature and humidity data from SASP are strongly influenced by the surrounding terrain. Cool air draining from the upper basin often ‘pools’ at the SASP site overnight, dropping overnight low temperatures well below those at the immediately adjoining terrain. 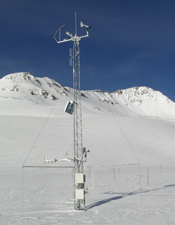 SASP consists of a 6m (20′) pipe mast with an extensive array of instruments, a stand-alone precipitation gauge, and a surrounding 30m x 30m snow profile plot. The site is generally level, sloping 3 degrees ENE. Signage advises the general public to avoid approaching the mast or entering the snow profile plot and cooperation has been excellent. Data is acquired via RF link. 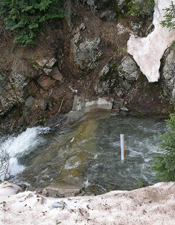 Precipitation is measured at SASP in an open-topped collector where new snow quickly melts in an alcohol solution. The accumulated fluid is weighed every five seconds and the new accumulated liquid water equivalent is reported, in 1 millimeter increments, at the end of the hour when measured. Precipitation data (mm of water) are also reported as daily totals, and as a “water year” running total, starting October 1 of each winter season. 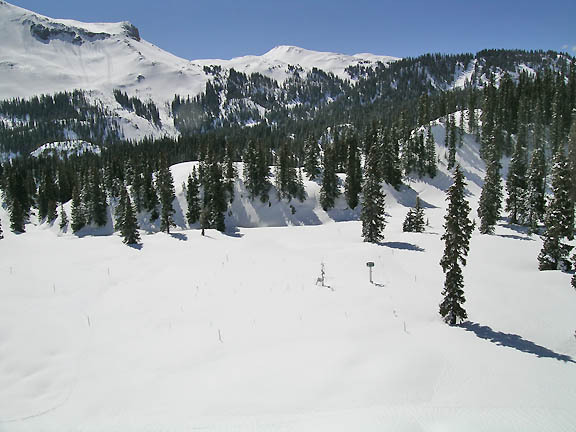 Snowpack depth, also referred to as height-of-snow (HS), is measured, in meters, at the end of each hour by an ultrasonic distance sensor designed for monitoring HS. Air temperature (Celsius) and relative humidity (percent) are measured every five seconds at a fixed height on the tower. Incoming short- and long-wave radiation values are measured, in watts per square meter, every five seconds by individual sensors at the top of the tower. 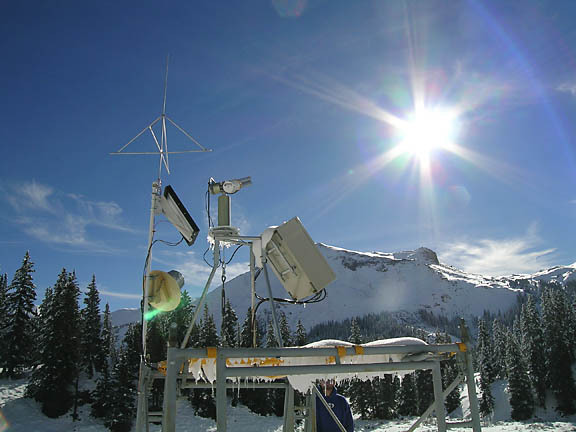 A proxy for long-wave radiation emitted from the snowpack surface is monitored by measuring the snowpack surface temperature (Celsius) every five seconds using a sophisticated infrared temperature sensor specifically designed for snow measurements. All these five-second measurements are averaged each hour to generate 1-hour data, and again once every 24 hours, at midnight, to generate 24-hour ‘summary’ data. Times reported are in Mountain Standard Time; we do not utilize daylight savings time. At the top of the SASP mast are deployed a wind monitor (RM Young™ Model 05103-5), two up-looking, full-range pyranometers (Kipp & Zonen CM21, 305-2800 nm (50% points)), a third filtered pyranometer (Kipp & Zonen™ CM21 with RG695 filter dome, 780-2800 nm (50% points)), and a pyrgeometer (Kipp & Zonen™ CG4). One of the full-range up-looking pyranometers is deployed with a fixed shadow band for measurements of diffuse radiation at solar noon. 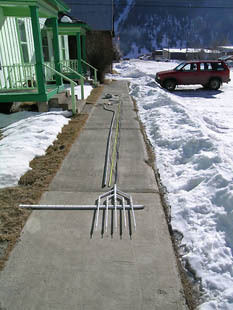 The shadow post is modeled upon the Swiss’s Alpine Surface Radiation Budget project specifications. Air temperature and humidity are monitored ( Campbell Scientific™ CS500) at the level of the upper wind monitor. 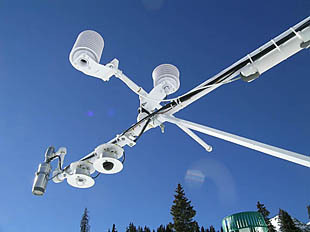 An arm extending due south from the lower part of the mast contains two down-looking pyranometers measuring reflected radiation from the snow surface, one full-range (Kipp & Zonen CM21, 305-2800 nm (50% points)) and one filtered (Kipp & Zonen™ CM21 with RG695 filter dome, 780-2800 nm (50% points)). 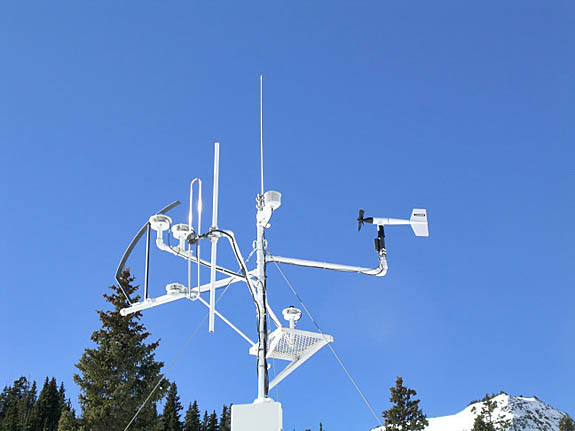 Also deployed on this arm are an air temperature and humidity sensor (Campbell Scientific™ CS500), ultrasonic snow depth sensor (Campbell Scientific™ SR50) and an infra-red snow surface temperature sensor (AlpuG GmbH™ SnowSurf). The SASP precip gauge (ETI Instruments™ Noah II), shown here in late fall, is a fully automated, transducer-type gauge with a reservoir of alcohol fluid and a standpipe for waste storage. No fluids are released on site. 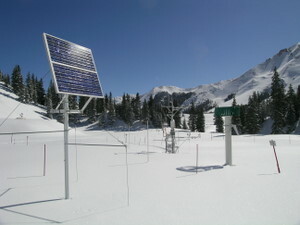 The single 40 watt photovoltaic panel seen in the photograph charges a 400 amp-hour battery bank contained in the enclosure located on the ground next to the precip gauge. 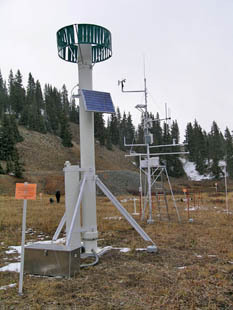 Precipitation storm totals are monitored using a manually measured ‘storm board’ at the site, to corroborate the precipitation gauge measurements. 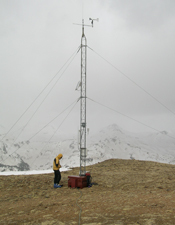 Seen here during assembly, the SASP also includes a snow temperature sensor array deployed near the mast. This array is identical in its design and use to the snow temperature array deployed at SBSP. 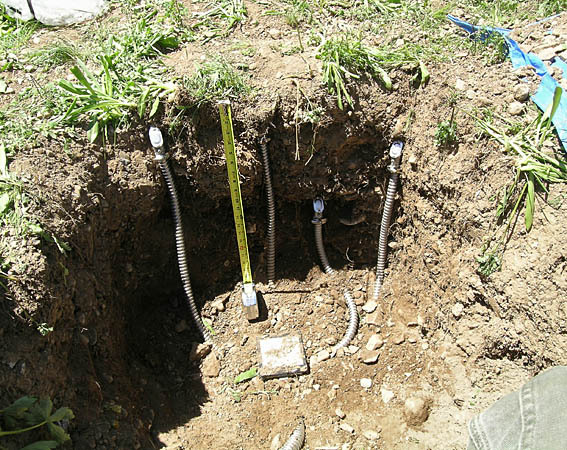 During the summer of 2005 we installed soil monitoring sensors to the SASP array: a soil heat flux plate (Rebs™ HFT3), a soil water content reflectometer (Campbell Scientific™ CS616), and soil temperature probes (Campbell Scientific™ 107).